Kolkata: The last rites of sub-inspector Amitabha Malik, who was killed when supporters of GJM chief Bimal Gurung allegedly fired at a police team yesterday, was performed today with full state honours after his body arrived at his ancestral home in North 24 Parganas district. The body was brought to the city airport in the afternoon from Bagdogra. Mr Malik's wife accompanied the coffin. It was later taken to his ancestral home in Madhyamgram in a hearse by road and subsequently to Nimtola crematorium at around 5 pm. Mr Malik was killed and four other policemen were seriously injured after Gorkha Janmukti Morcha (GJM) supporters allegedly fired at the police team at a forest area near Darjeeling yesterday. The police was on the trail to nab Mr Gurung, who was suspected to be hiding there. 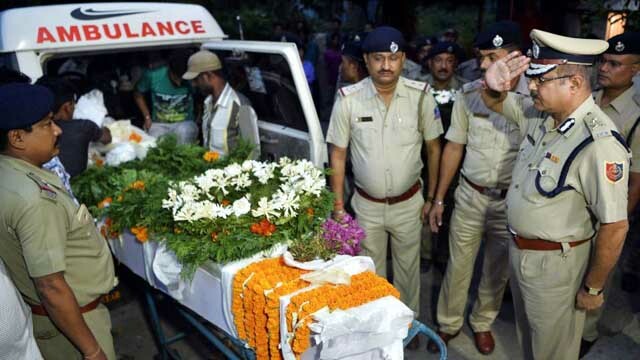 West Bengal Education Minister Partha Chatterjee and Food Minister Jyotipriyo Mallick received the body at the airport and offered floral tributes to the policeman. Both the ministers, along with other leaders and senior police officials, accompanied the coffin to his ancestral home where gun salute was given by the state police in the presence of DGP Surojit Kar Purokayastha and other top officials. As Mr Malik's wife broke into tears, his family members, neighbours and a large number of people assembled at a club ground at Madhyamgram, where the coffin was kept for people to pay their last respect. Mr Chatterjee handed over a cheque of Rs. 5 Lakh to the family of the deceased on behalf of Chief Minister Mamata Banerjee and assured the family that appropriate action will be taken against those behind his killing. "Our son's soul will rest in peace only if Bengal remains undivided and Darjeeling continues to remain a part of it," Mr Malik's parents said. Mr Gurung has been on the run since August after cases under the Unlawful Activities (Prevention) Act were slapped against him for his alleged involvement in several bomb blasts in Darjeeling and its adjoining areas. This is the first incident of violence after the 104-day long indefinite shutdown in the hills was called off on September 26 by Mr Gurung, following an appeal by Union home minister Rajnath Singh. The last rites of sub-inspector Amitabha Malik, who was killed when supporters of GJM chief Bimal Gurung allegedly fired at a police team yesterday, was performed today with full state honours after his body arrived at his ancestral home in North 24 Parganas district.